Constructed in the early 2000s by Intracorp, this building contains two-level units with 17' ceilings in the open living areas. South facing lofts overlook St. James park and church. Loft units range in size from about 650 sq. ft. to approximately 1600 sq. ft. Some of the units have fireplaces and open balconies. Excellent location, within walking distance to the St. Lawrence Market and numerous cafes and shops on Front Street. One dog or two cats are allowed. Management company is Skywater Property Management, 416-481-5656. Located in a residential neighbourhood of High Park and surrounded by tall trees, this is a recent conversion of a Neo-Gothic stone church. Some of the loft units feature exposed limestone walls, and some of the two-storey lofts feature impressive 24-ft ceilings. Finishes vary in quality, but the location is indeed excellent. Conversion was finished in late 2007. 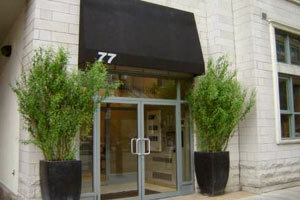 An intimate 29-unit loft building located within walking distance to the St. Lawrence Market. This is a hard loft conversion, and features 10.5, 11 and 22-feet ceiling heights, concrete walls and ceilings, exposed heating ducts and huge windows. Unit sizes vary from 600 to over 2000 sq. ft. Many of the lofts have terraces and parking, and dogs are allowed. Management company is Skywater Property Management, 416-481-5656. 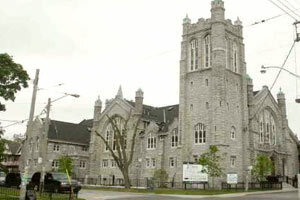 A small, 12-unit New York style loft building located in a former Armory in a popular Beach neighbourhood of Toronto. Custom spaces feature exposed brick and high, 16-feet ceilings. Some of the loft units have fireplaces, and most have open balconies or terraces. Due to the small size of the building and narrow hallways only medium size dogs are allowed. Management company is Orion Property Management, 905-670-0501. If you are looking for a loft or would like some more information, please contact us. We will be glad to help you with your loft search.